Based on the findings of the transect, this could be a possible food web for the 20x20 space. These are the results of the caffeine treated vs control zebrafish. Day 6: caffeine fish visually slower. Day 7: 15 live fish in control group; 16 live fish in caffeine group. Day 10: 11 live fish in control group; 12 live fish in caffeine group. Day 11: All fish dead besides one control fish. The caffeine-treated fish were darker than the control fish. Measurements of control fish on day 11: 3, 3, 4, 4, 4, 4, 4.5, 5, 5, 5, 5. The mean length of the control fish is 4.2mm. Measurements of caffeine fish on day 11: 1.5, 2, 2, 2, 2.5, 2.5, 3, 3, 3, 3, 3.5, 4. The mean length of the caffeine fish is 2.7mm. 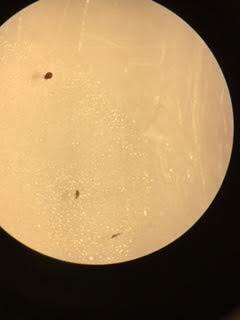 Above is an image of a control zebrafish on day 7. Above shows an image of a control zebrafish on day 11. Above shows an image of a caffeine-treated zebrafish on day 11. Purpose: The purpose of this experiment was to find which types of organisms existed in the transect by observing their nucleotides. Rather than using a dichotomous key to classify the different organisms, small samples were taken and put through a PCR in order to determine their identities. The hypothesis of this experiment was that the species would be a rod-shaped bacteria, as a majority of the bacterial findings were rod-shaped under the microscope. Materials and Methods: A PCR was used to take gel samples from each hay infusion culture from before. 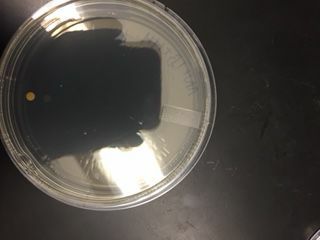 The samples were taken from the bacterial growth agar plates and inserted into a small growth pallet, then sent to a lab for nucleotide classification. To determine the identity of the bacteria, the sequence submitted by the lab was then inserted into the Blast website. 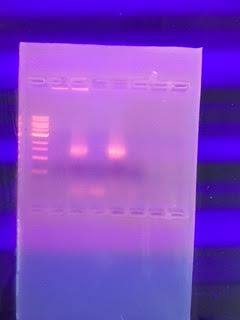 Below is a picture of the DNA after it was put into the PCR. 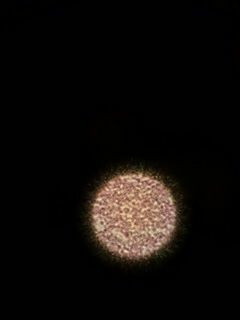 With a high alignment score, the Blast website identified this as the Bacillus cereus gene. Conclusions and Future Directions: This sequence analysis corresponds to colony morphology, gram stain, and motility studies. In terms of colony morphology, scientists can infer not only that Bacillus cereus is present, but also types of bacteria that often live with/around this bacteria. Knowing that this type of bacteria is in the transect contributes to the overall understanding of the transect, as different types of bacteria often choose certain places to live. Furthermore, gram stain studies are involved in this experiment because they determine whether something is gram negative or positive. Along with some research, the identity of Bacillus cereus is found to be gram positive and rod-shaped. 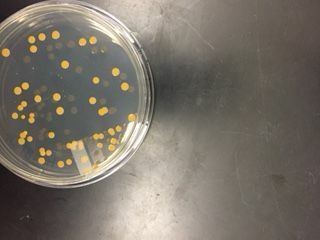 Lastly, this experiment was relevant to motility studies because it is evident that this bacteria is able to move in and around its colony. Purpose: The purpose of this experiment was to test external chemicals on the embryonic development of zebrafish. Using a control and treated samples, half of the zebrafish eggs were given caffeine. The group hypothesized that the zebrafish given the caffeine solution would be shorter in length and slower in movement, as it is likely that their muscle development will also slow. 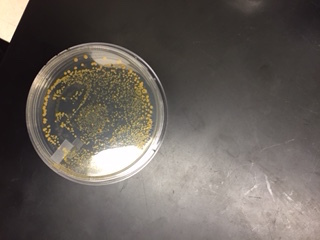 Materials and Methods: First, the group obtained four petri dishes with twelve spots each. On the petri dishes, the group wrote their names, the date, and whether the dish was a control or treated. Then, two of the dishes (24 spots) were filled with 2mL of Deerpark water to create the control. The other dish was filled with water and 2mL of 40g/mL of caffeine. The eggs, which are small and clear, were then obtained from the environment that was provided. This was performed using a pipette. After 48 eggs were found, 24 were put into separate wells in the control group, and the other 24 were put into the wells of the caffeine treatment petri dish.The fish then had to be fed once they hatched with shrimp solution. Observations and Data: By the time they were checked on day 4, some of the embryos had hatched intro fish. The fish are black and white and linearly shaped. By days five and six, it appeared that the caffeine-treated fish were moving more slowly. This image shows an example of the control fish. The image above displays some of the caffeine treated fish. Conclusions and Future Directions: In the future, the group needs to take more precaution in keeping the fish alive. Some of the organisms have already died, which may have been fixed by adding water or food to their solutions more frequently. 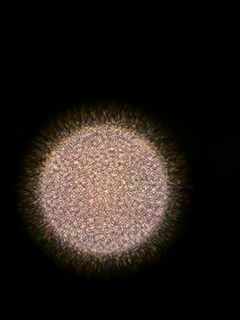 Furthermore, it is important that the group found viable embryos to use in the experiment, rather than egg shells that simply appeared to look like embryos. In the future, the group will continue to watch the fish closely as well as feed them every day. In order to make final conclusions, the group will measure the length of the bodies of the fish as well as how fast they move. Purpose: After creating a small environment using Berlese funnels, the group took samples from the area to find different types of invertebrates. Using a key to identify each type of invertebrate found, the group was able to observe the types of species located in the transect. The group's hypothesis was that there would be many different types of invertebrates observed. Materials and Methods: In the last week, a Berlese Funnel station was set up in order to create an environment for the invertebrates. This was performed by collecting leaves from the transect, placing them in the funnel, and then attaching it to a conical tube. Inside this conical tube was 25mL of ethanol/water solution. Then, the Berlese funnel was put on a ring stand and kept under a light for a week. This week, the group poured the contents of the funnel into two petri dishes. 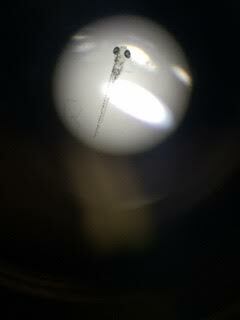 Using a microscope, the petri dishes were observed to find invertebrates. These invertebrates were measured and then classified using a dichotomous key. Observations and Data: The following is a table listed by: organisms (phylum and class), length in mm, number in sample, and description of organism. This image shows invertebrate #1. This image shows, from top to bottom, invertebrates 2-4. This image shows invertebrate #5. The group also hypothesized what other animals could be found in the transect. Squirrels: classification is Chordata, Mammalia, Rodentia, Sciuridae, Sciurus - Sciurus carolinensis. An abiotic factor they could use include the wood circling the gardens (to break down acorns). A biotic factor they might use is the fruit grown in the garden. Rats: classification: Chordata, Mammalia, Rodentia, Muridae, Rattus - Rattus norvegicus. An abiotic factor they could use would be the mulch, which they might burrow under for safety. A biotic factor would again be the fruit to eat. Robins: classification: Chordata, Aves, Passeriformes, Turdidae, Turdus - Turdus migratorius. An abiotic factor they could use would be the mulch in order to build a sturdy nest. A biotic factor they could use would be the leaves, which would also help them create a good nest. Bluejays: classification: Chordata, Aves, Passeriformes, Corvidae, Cyanocitta - Cyanocitta cristata. An abiotic factor they could use would be the mulch in order to build a sturdy nest. A biotic factor they could use would be the leaves, which would also help them create a good nest. Rabbits: classification: Chordata, Mammalia, Lagomorpha, Leporidae, Sylvilagus - Sylvilagus floridanus. 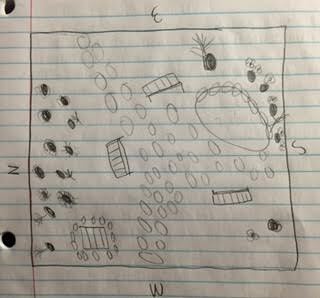 An abiotic factor they could use would be the wooden square which would give them shelter Biotic factors would be the leaves/fruit, which they could eat. Conclusions and Future Directions: Based on the group's observations, the hypothesis was wrong because we only found three types of invertebrates. Two of the same kind of invertebrate were found, leading us to believe that there was not as much biodiversity in the funnel experiment as we originally thought. However, after observing these invertebrates and predicting what types of vertebrates would be present, the group was able to analyze terms such as "community," "carrying capacity," and "tropic levels." This transect represents a community because it houses many different organisms. The term trophic levels help us understand where each of these different species exist on the food chain, which is shown in a diagram below. Finally, the carrying capacity predicts how many organisms a certain environment can house before it becomes overcrowded. The transect is most likely not overcrowded yet because animals and plants are still alive and prospering. Purpose: The purpose of this lab was to identify different types of plants and/or fungi found in the transect. After identifying the plants, they were further classified by their vascularization type and reproductive mechanisms. The group hypothesized that the plants found would all be dicots, as they are more common. Materials and Methods: First, the group went out to the transect and collected five different types of plants to use for identification. The plants were stored in a ziploc bag and then brought back into the lab. Once in the lab, each leaf was measured in centimeters with a ruler. 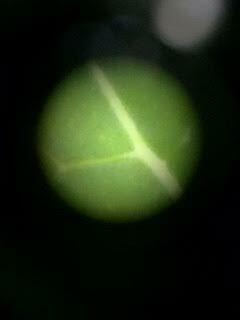 Then, the group took small pieces from each plant and placed them under a microscope to observe the plant's features more closely. At the end of the lab, a PCR was used to take gel samples from each hay infusion culture from before. 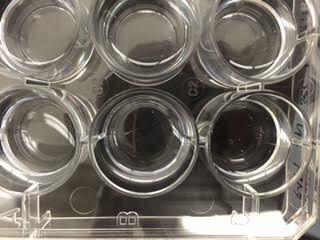 The samples were made last week, taken from the bacterial growth agar plates and inserted into a small growth pallet. This is transect sample plant #1, which was found in transect 5 and is a ground plant. It was in one of the garden squares. This is transect sample plant #2, which was found in transect 5 and is a ground plant. It was in one of the garden squares. This is transect sample plant #3, which was found in transect 5 and is a ground plant. It was in one of the garden squares. This is transect sample plant #4, which was found in transect 5 and is a ground plant. It was in one of the garden squares. This is transect sample plant #5, which was found in transect 5 and is a ground plant. It was in one of the garden squares. The following results were noted in a table about each plant found in the transect. 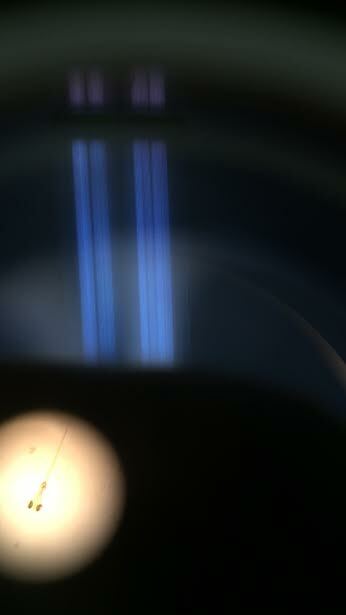 The above photo shows the results of the PCR from the hay infusion samples taken in the last week. 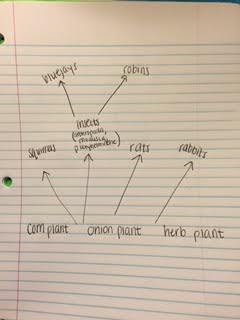 Conclusions and Future Directions: The hypothesis was supported because there was a 4:1 ratio of dicots to monocots. This displays that, at least in plants that grow food, dicots are more common. Next time, the group should take more caution when choosing plants. The ratio may not be very representative of the real world, so instead of taking any plants available, the group might try to find more monocot plants. 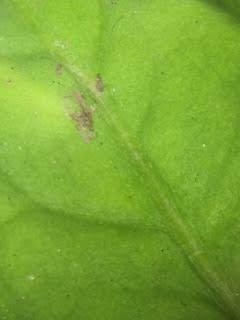 Furthermore, all of the plants found were tracheophytes. Next time, the group should look for a more diverse group of plants if they are available. Purpose: The purpose of this lab was to study different types of bacteria and analyze whether the samples were gram positive or negative. Furthermore, the growth in each sample, based on the amount of tetracycline added, was evaluated. 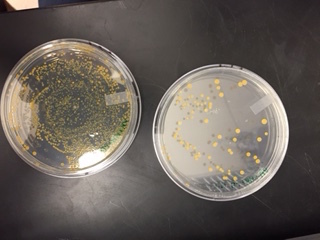 The group hypothesized that the bacteria samples with less dilutions would result in more growth. Materials and Methods: In the week prior to this experiment, eight bacteria samples were taken from the hay infusion culture. In four of the samples, nutrients without tetracycline were added with labels 10-2, 10-4, 10-6, and 10-8. The same procedure was performed with another four bacterial plates, but tetracycline was added to these cultures. 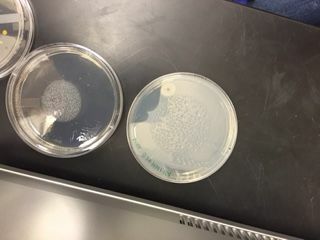 After incubating for a week, the bacteria grew within each plate. Using the four samples which held the most growth (2 non-tet and 2 +tet), small samples of each were taken and put onto a microscope slide. In this instance, the 10-2 and 10-4 samples were used. 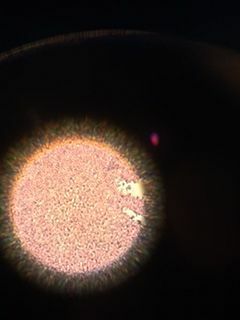 This was performed by sterilizing a loop over a flame, scraping a small amount of growth, and then initiating the gram stain procedure. A drop of water was added to each slide and then placed onto the staining tray. Crystal violet was added for a minute, rinsed off, and then followed by Gram's iodine, 95% alcohol, and then safranin. Each stain was removed with water before the next was added. After this process was done, each slide was wiped off, ready to be observed in the microscope. This image shows the 10-3 and 10-5 serial dilutions without tetracycline. This is the 10^-5 dilution with tetracycline. This is the 10^-7 dilution with tetracycline. This is the 10^-3 dilution with tetracycline. These are the 10^-9 bacterial samples that did not grow. Below show the images of the bacteria under the microscope. This is the 10^-3 dilution without tetracycline. This is the 10^-5 dilution without tetracycline. Conclusions and Future Directions: The hypothesis was correct, as the most growth was seen in the plates with the least dilution. The data from the microscopes also revealed that there was a wide range of bacteria found in the transect, as each sample showed a different type. Going forward, the group will have to use a chart to identify the classifications of the different types of bacteria found, not just their shapes. Furthermore, research could be conducted to see if gram positive samples are less common than gram negative samples. In the experiment, more gram negative positive samples were found. It is important to note that growing bacteria with many serial dilutions will not work well. 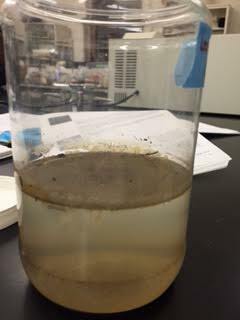 Purpose: The purpose of this lab was to classify protists found in the hay infusion sample. After extracting small samples at all levels of the sample, dichotomous key was used to categorize the types of protists represented. The group hypothesized that many different protists would be observed, as there is usually wide diversity in every environment - no matter how small. Materials and Methods: The hay infusion sample was created by taking a sample from the transect and preserving it in a plastic bag. Placing about 10 grams of these items (soil, leaves, etc) into a plastic jar created an environment for these items to live. Following this, 500mLs of deerpark water and 0.1 grams of dried milk. A lid was temporarily placed on the jar so that the items could be mixed together, but then the lid was removed so the environment would have access to air. After a week, samples were taken from the top, middle, and bottom of the hay infusion sample. 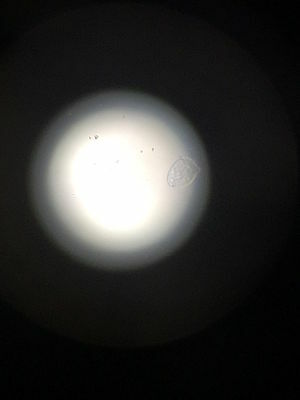 Each one was placed on a microscope slide and cover slip, then put under a microscope to observe the protists in the sample. 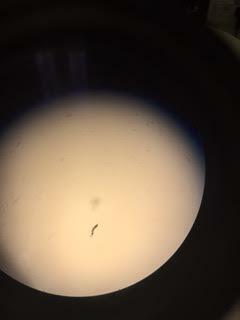 Results were noted and the protists were identified using a dichotomous key. 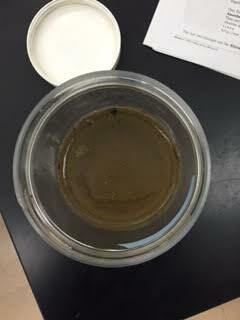 Data and Observations: The hay infusion sample had a foul smell after a week. The top layer was creamy, while the middle layer was a musky brown color. At the bottom of the jar, a layer of what looked to be dark mud was sitting there. 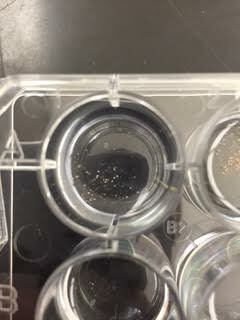 Six different protists were observed, two from each layer of the hay infusion. This shows a side view of the hay infusion. This displays an aerial view of the hay infusion. Within the top layer, pandorina and difflugia were found. Both can be seen in the photo above, though they were difficult to photograph as they were very small. The pandorina was faint green and had a round shape. 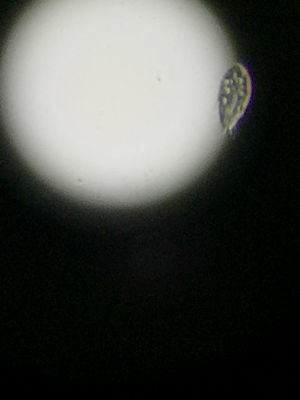 About 40 micrometers, it had a flagella to move. Because it was green, it can be assumed that this a type of algae that does photosynthesis. On the other hand, diffuglia is a protist. It was brown in color and had an oval shape. 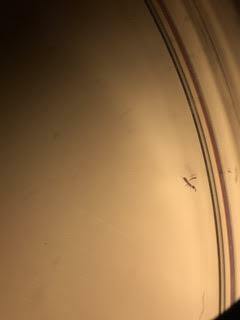 Measuring 150 micrometers, it moved very slowly. 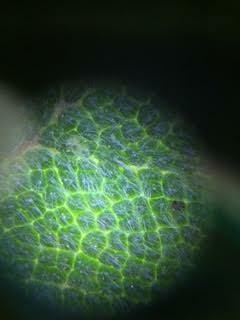 In the middle layer, paramecium and euglena were observed. Above, the paramecium is displayed. 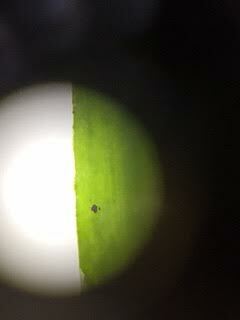 It was green and 30 micrometers. It moved very quickly because of its many cilia. 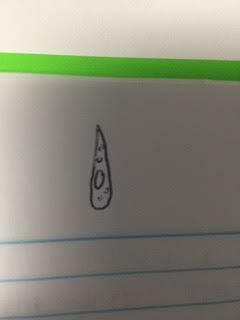 Paramecium is a protist. Above displays a drawing of the euglena, as it was hard to capture on the microscope. 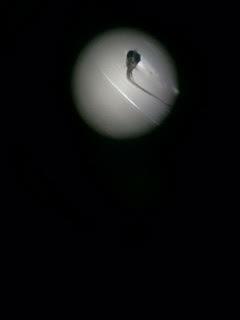 It measured around 70 micrometers and was green with cilia. 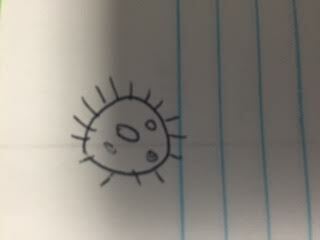 This is neither a protist or algae; it is a mixtroph. In the third layer, colpidium and pelomyxa were observed. Both pictures are shown below (pelomyxa first). Pelomxya is a protist. It was green and had flagella, about 500 micrometers. 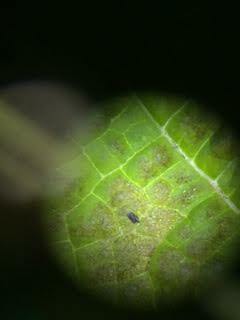 The colpidium is also a protist, about 50 micrometers and green in color. 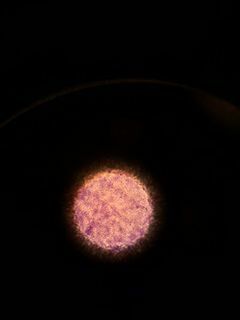 This organism had cilia. 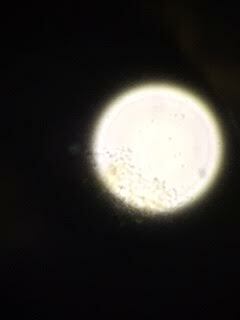 Conclusion and Future Directions: The data supported the hypothesis, as it allowed the group to see many types of protists. In each layer of the hay infusion, a different protist was shown. It is likely that there were many more protists and types of algae that the group did not see. Overall, it is obvious that protists can grow in varied environments. Furthermore, there is a lot of variation in the protist family. Some of the organisms were much bigger than others, for example: the pelomxya was 500 micrometers and the pandorina was only 40 micrometers. The organisms also varied in shape and color. The experiment worked because the environment was given food (the milk), sunlight, and oxygen. If the group were to repeat this experiment, it would be better to spend more time on finding usable samples so that the protists are easier to find on the microscope. Purpose: The purpose of this lab was to observe a niche on the American University campus, analyzing its abiotic and biotic factors. In order to study evolution and environment, a 20x20 outdoor area was used as an example. It is likely that there were more abiotic factors than there were biotic factors. Materials and Methods: Materials: -pencil -paper -plastic bag -20x20 outside area labeled with sticks -method of photography (cell phone) Methods: -First, the group found its location on the American University campus. The section used for this data was section 4. -After acknowledging the area, an aerial diagram of the 20x20 space was drawn using pencil and paper. -Following the drawing, the group filled their plastic bag with abiotic and biotic factors. This is an aerial diagram drawn with pencil. On the diagram, the directions (N,E,S,W) can be shown as well as rocks, benches, plants, and a body of water. Besides the aerial diagram, pictures of the area were taken with a cell phone. They show the factors described previously. The transect also had a water drain, acorns on the ground, a net that covered the water, and rocks that lead a pathway throughout the whole transect. Much of the soil was moist and about half of the trees had no leaves. Conclusions and Future Directions: Within this transect, there were many biotic and abiotic factors found. Abiotic components included soil, rocks, water, sticks, air, and sunlight. Biotic factors included bushes, flowers, trees, leaves, moss (in the water), bamboo (on the water net), grass, acorns, and squirrels (though these were not seen, there was evidence of them). In contrast with the hypothesis, more biotic factors were measured than abiotic factors. This could be because there were actually more biotic components in the area or simply that not enough abiotic components were measured. Next time, more background on abiotic factors should be researched so that more accurate data can be taken. This page was last edited on 9 March 2016, at 22:05.